The corn is up! 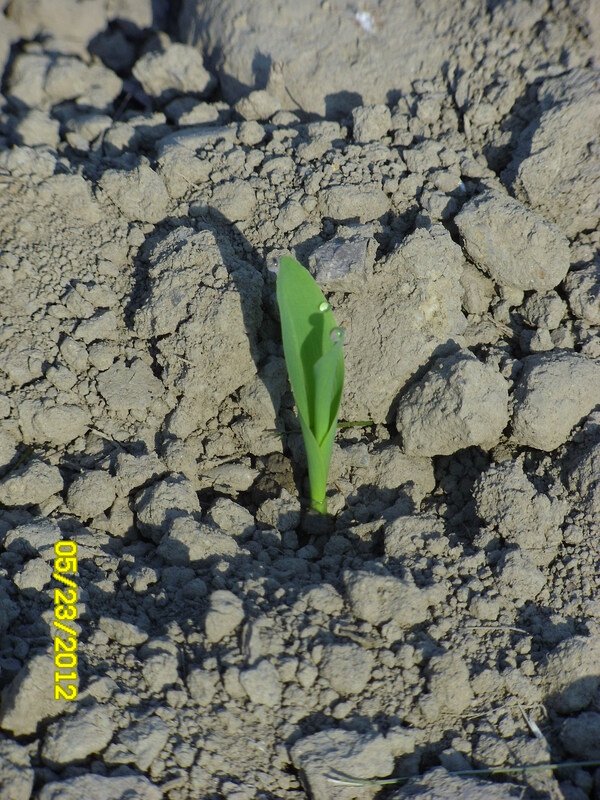 This is a picture from the first field that sprouted. Dad has been planting corn since the 14th of this month, sometimes all through the night. He has 145 acres done, with about 95 acres left to plant. The corn we grow is used for two differt types of cow feed: corn silage and grain. Corn silage is the entire plant chopped up and stored in a silo. For grain we use our combine to only harvest the dried kernels. The kernels then go into the grain recipe our nutrionist writes. The picture I posted was taken yesterday. Already, you can count the rows in the field. This means the plants are tall enough that you can distinctly see the sprouts and the rows they were planted in. It’s hard to believe this tiny sprout will soon be over 7 feet tall! And you thought your kids grew fast! Although the corn is starting to shoot up, we need some rain. It hasn’t rained since Dad planted the field, over 10 days ago. Thankfully there is enough moisture trapped in the ground to let the corn start growing. A good soaking though would really kick the plants into high gear.